Legislation to audit the Fed is not new in Congress. Back in 2012, Rep. Ron Paul’s bill to increase Fed transparency passed in the House by a whopping 327 to 98. After overwhelmingly passing the House, you would think that the Senate would at least vote on it, right? Unfortunately, Senate Majority Leader Harry Reid refused to bring it to a vote. The same guy who accuses others of being stubborn held up a popular bill that 74% of the American public supports. What happened to that Harry Reid? Today’s Harry Reid has continued to block bills to audit the Fed for years. Senator Rand Paul has introduced legislation to open the books at the Fed, S. 202. The Federal Reserve Transparency Act currently has 29 cosponsors in the Senate. Yet, it hasn’t been voted on. Senator Paul is now threatening to put a hold on three nominees for the Fed’s Board of Governors until he gets a vote on this important bill. I am writing to convey my objection to floor consideration of the pending nominations to the Federal Reserve System, Executive Calendar No. 767, 768, 769, and 771 without also considering legislation to bring much-needed transparency to the Fed. As the Senate debates the Federal Reserve Board nominees, there is no more appropriate time to provide Congress with additional oversight and scrutiny of the actions and decisions of the central banks. Therefore, I request that my bipartisan legislation, S. 209, the Federal Reserve Transparency Act, be scheduled for an up or down vote concurrently with nominees to the Federal Reserve Board of Governors. My bill calls to eliminate all restrictions placed on Government Accountability Office (GAO) audits of the Federal Reserve. The Fed's credit facilities, securities purchases, and quantitative easing activities would also be subject to Congressional oversight. Similar legislation passed 327-98, with bipartisan support, in the House of Representatives on July 25, 2012. This same bill has been stalled in the Senate for more than three years. Accordingly, I will object to any unanimous consent agreement or the waiver of any rule with respect to these nominees without a vote on S. 209. I know you have been an outspoken proponent of Federal Reserve transparency in the past, and I hope we can work together to pass this important legislation. 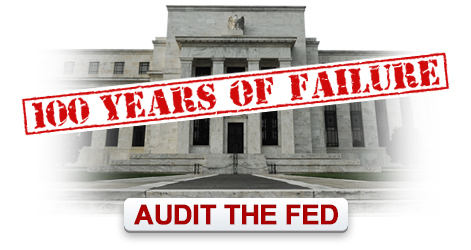 A real audit the Fed bill needs to pass. The American people deserve to know what is going on behind closed doors.